Since SAP introduced its in-memory database, SAP HANA, customers have significantly accelerated everything from their core business operations to big data analytics. But capitalizing on SAP HANA’s full potential requires computational power and memory capacity beyond the capabilities of many existing data center platforms. To ensure that deployments in the AWS Cloud could meet the most stringent SAP HANA demands, AWS collaborated with SAP and Intel to deliver the Amazon EC2 X1 and X1e instances, part of the Amazon EC2 Memory-Optimized instance family. 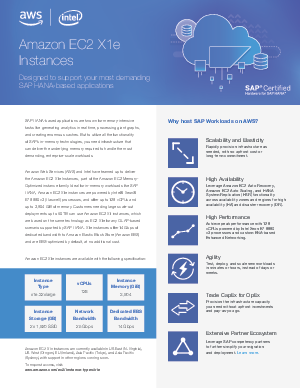 With four Intel® Xeon® E7 8880 v3 processors (which can power 128 virtual CPUs), X1 offers more memory than any other SAP-certified cloud native instance available today. X1 instances offer 2TB of DDR4-based memory, and AWS recently introduced a new instance—called X1e—which supports up to 4TB of RAM. X1 instances also provide 10 Gbps of dedicated bandwidth to Amazon Elastic Block Store (Amazon EBS) and are EBS-optimized by default at no additional cost. X1 instances are certified for scalable deployments of as many as 17 different nodes and can scale out to 50TB of RAM for any OLAP-based situation SAP HANA supports. X1 instances enable increased crypto-graphic performance via the latest Intel® AES-NI feature, which is a new encryption instruction set that improves on the Advanced Encryption Standard (AES) algorithm and accelerates the encryption of data in the Intel® Xeon® processor family and the Intel® Core™ processor family.